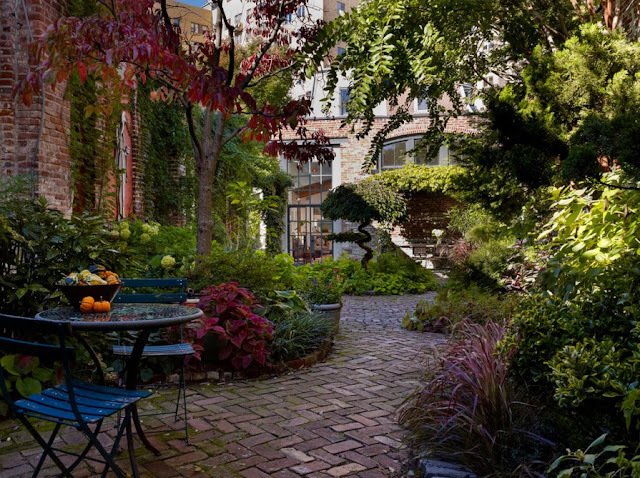 Brick patios often exude charm, and they’re the perfect addition to plant-filled spaces, as shown by the secret garden-style patio pathway below. 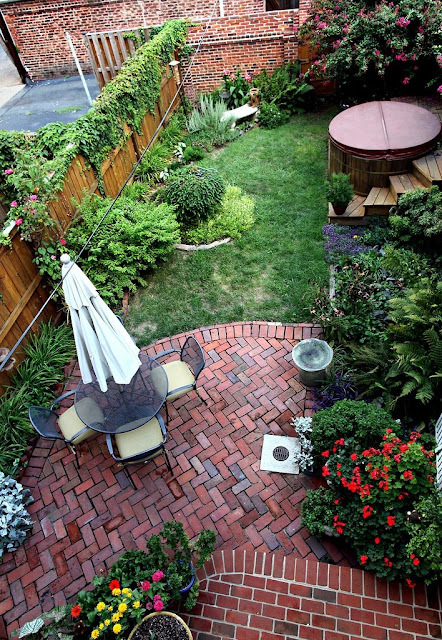 They’re also the perfect counterpart to lush green lawns, as shown in this next manicured space. 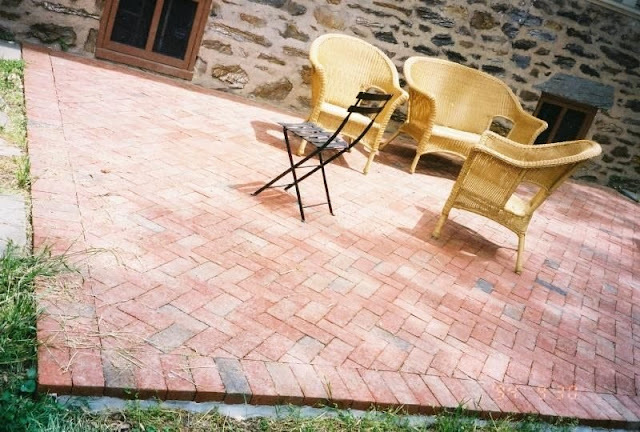 The patio was built with 1940s brick that was found on site! 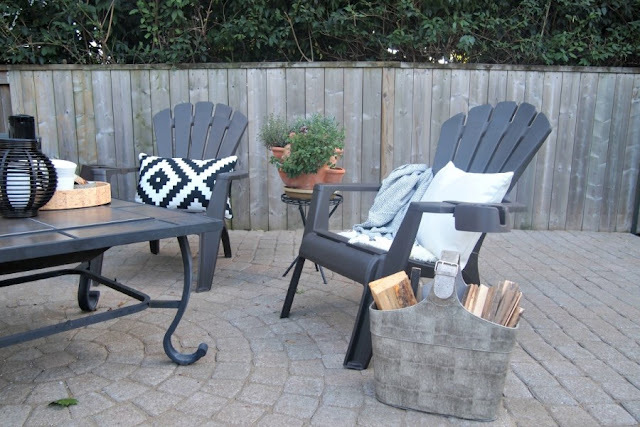 Another helpful DIY brick paver patio tutorial can be found at ehow. Brick is the perfect choice for small patios, and there are a variety of brick patterns you can choose from when it comes to getting the job done. 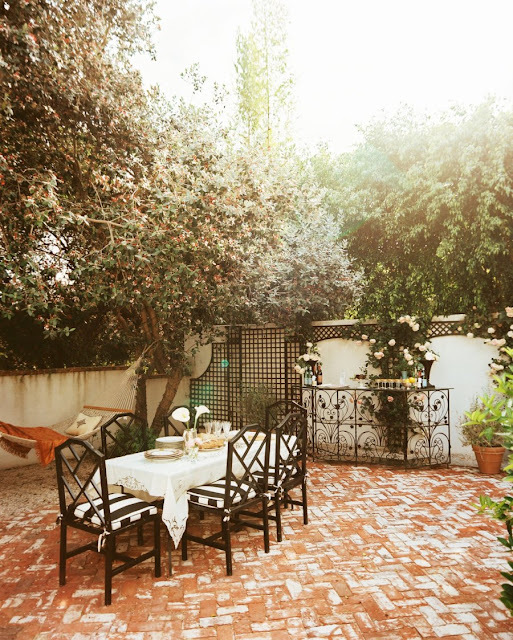 While many brick patios boast a more traditional style, there are plenty that veer into modern, Bohemian and eclectic territories. 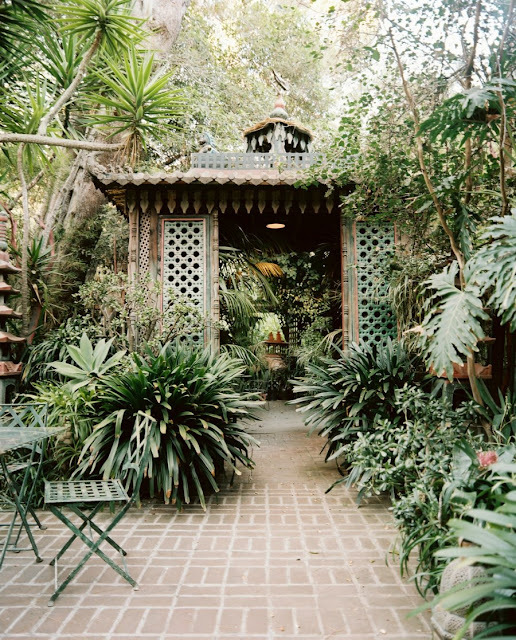 In fact, the eclectic brick patio below is filled with eye-catching details and Asian flair. Since bricks are small pieces in terms of landscaping materials, a range of patterns is possible when it comes time to lay the bricks. Below you will find a few of the most popular, starting with the jack-on-jack pattern by the pool. Note the neat rows, with one brick directly above another. The result: a sense of space and tidiness. When the bricks are side by side but also staggered from row to row, you have a running bond pattern. 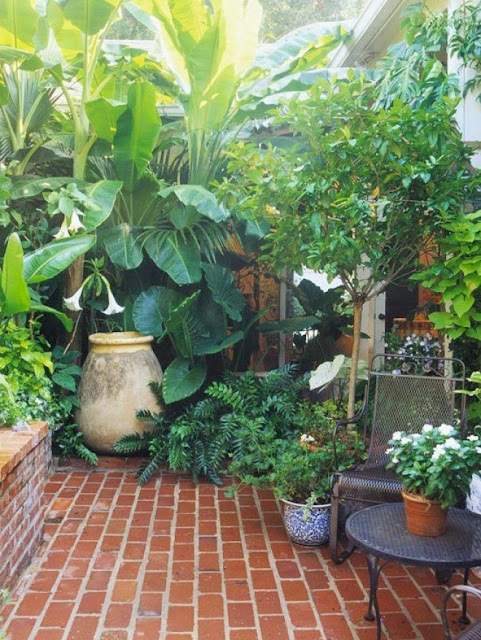 In the next image we see an example, thanks to a patio that creates a lush vibe with the help of ample plant life. When the bricks are two by two, and each set of two alternates direction, you have a basket weave pattern. 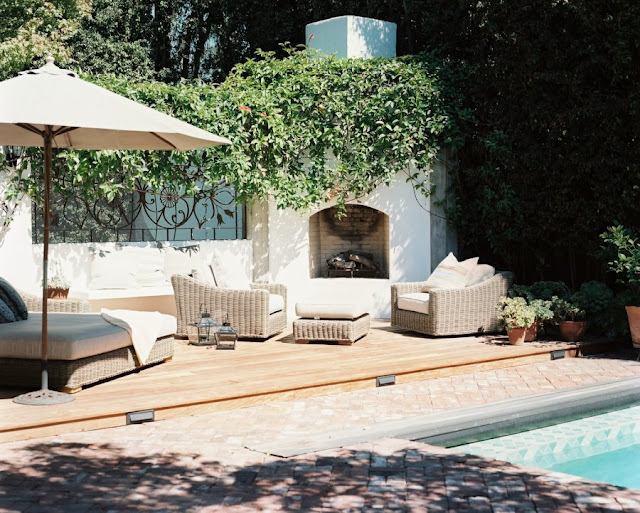 We see the perfect example below on this Beverly Hills patio that’s filled with charm. 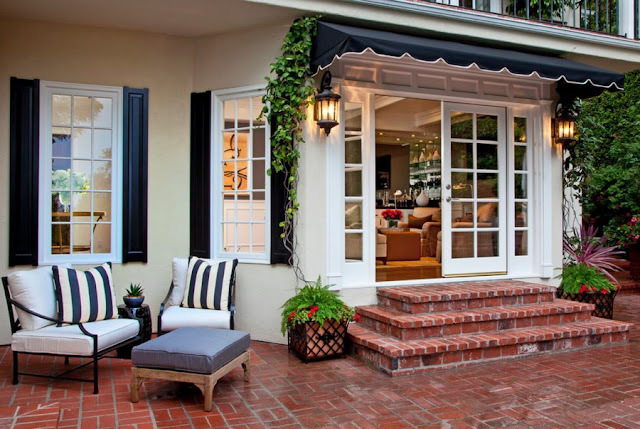 Let’s hear it for awnings and striped cushions! The herringbone pattern is a very popular choice, and in the next image is an example of the pattern on an eclectic patio with a dash of Midcentury flair. In the section that follows, we’ll learn more about herringbone patterns. And to learn more about all of the patterns mentioned today, head on over to this Lowe’s tutorial. What do we love about the herringbone pattern? Plenty! For one thing, the pattern is perfectly on trend, and it can be found in indoor spaces as well (on both walls and floors). 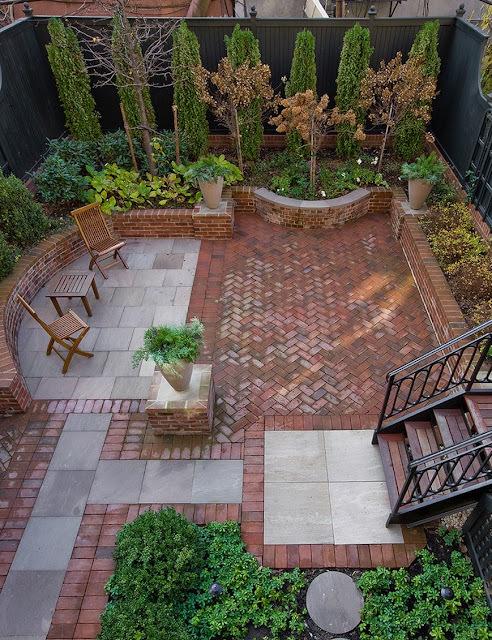 The curved patio below features a herringbone pattern, and it’s lined with bricks to create a border that stands out while remaining cohesive. 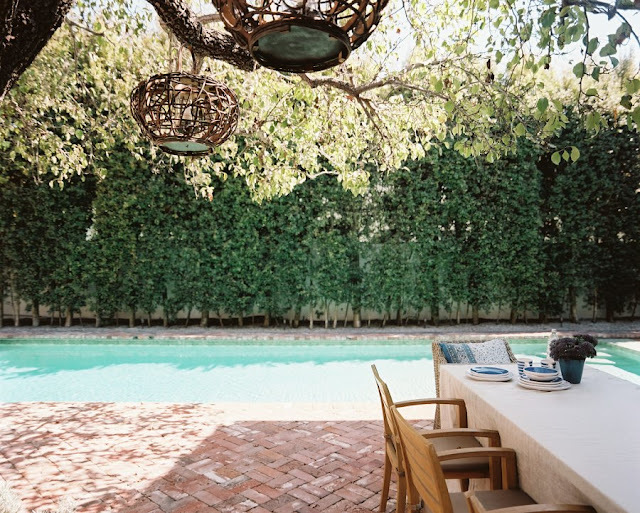 This poolside patio might seem to be herringbone at first, but take a closer look and you’ll see a basket weave brick pattern. If you love the angled look of herringbone but you want a pattern that features a two-by-two brick layout, this could be the solution for you. The patio features a lighter brick, which contributes to the breezy vibe and summer feel of the space. 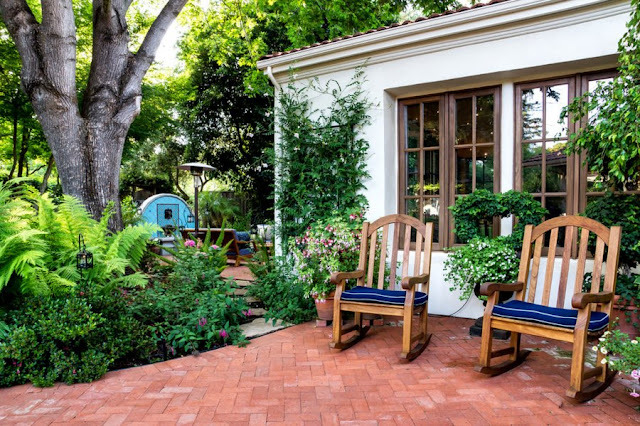 The perfect place for lounging, this patio even features privacy plants for added coolness and shade. A herringbone layout can create a textured look, especially if the brick has a weathered appearance. The outdoor dining area below exudes an atmosphere of relaxed elegance. 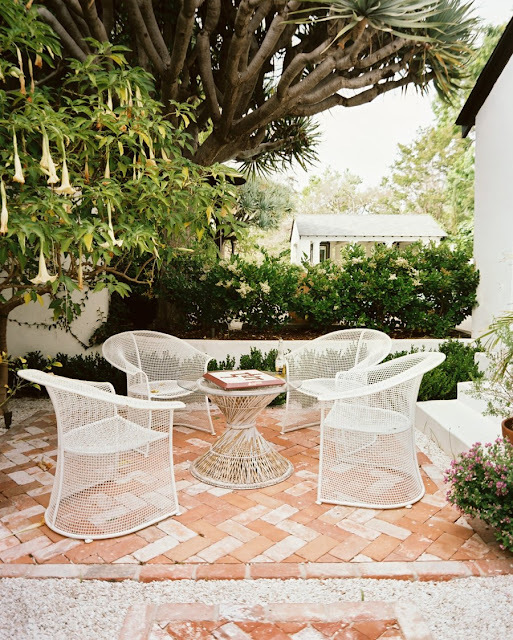 Rocking chairs adorn this next featured patio, which offers the perfect lounging spot, thanks to a beautifully arranged space featuring an abundance of plants. When you line a herringbone patio with bricks in a darker color, visual interest is created, and clear borders add depth to the space. 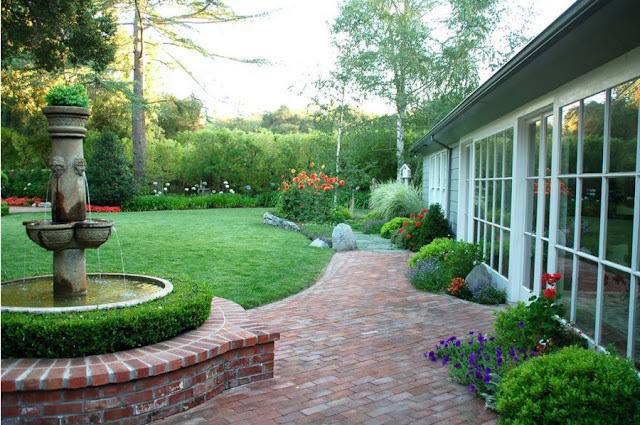 Brick patios with circular patterns create a subtle bullseye effect that can be charming or quite intriguing, as shown by the modern patio below. 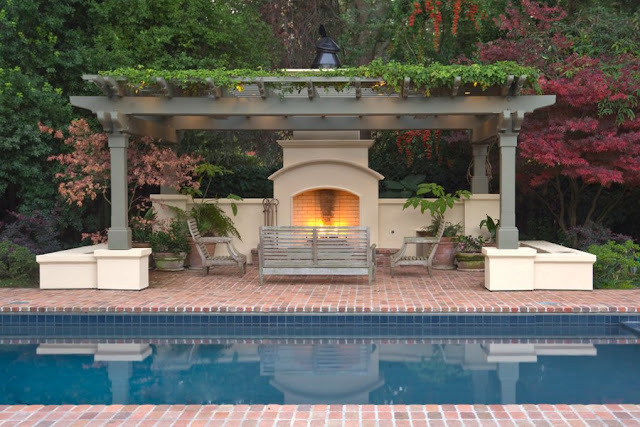 The center of the patio is a clear focal point, especially if you’re lucky enough to get an overhead view! Varying the size of the bricks can add additional interest, and a variety of subtle tones create a sense of depth. 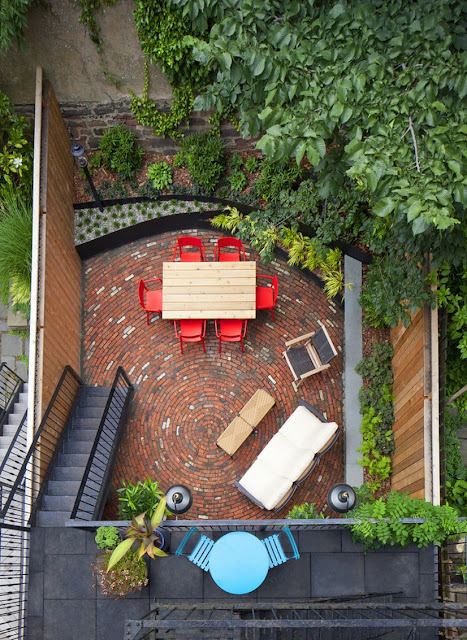 We’ll end today’s post with a couple of patios that illustrate the power of creativity, especially when mixed materials are involved. The wooden deck below is bordered by a brick patio and pool area featuring a basket weave pattern. The combination of wood and brick is a breath of fresh air. And in this last image, we see a small outdoor space that incorporates both brick and Safari Sandstone to designate different areas and create a sense of roominess. 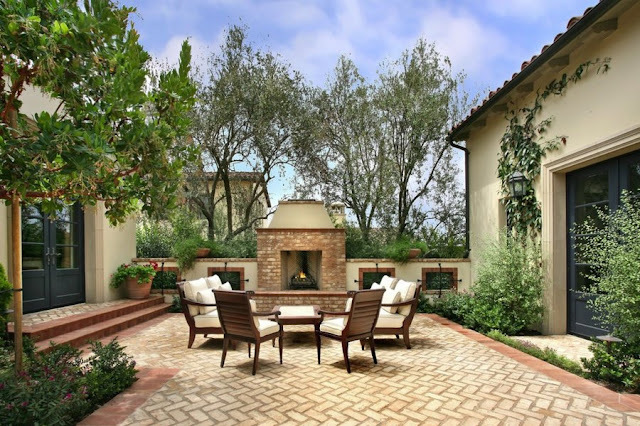 When it comes to brick patios, which materials and patterns do you prefer? Light brick or dark brick? Side-by-side bricks or a herringbone pattern?